Recognized by sight: Growing on Gymnopus fruit body. 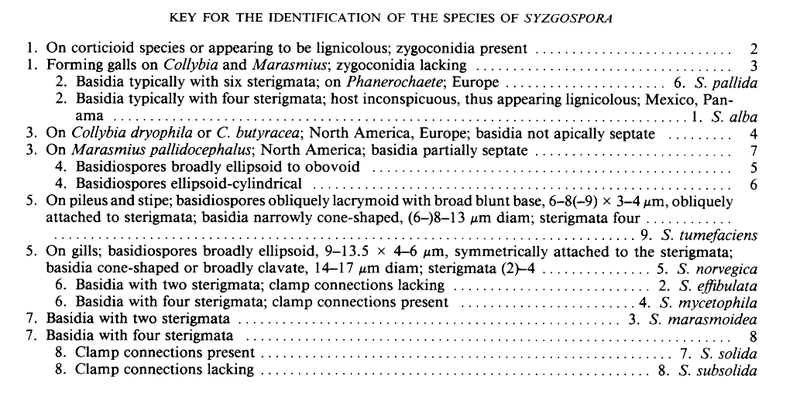 On Indexfungorum it says that Christiansenia mycetophila is a synonymy with Syzygospora effibulata amoung others, on MycoBank it says that_Christiansenia mycetophila_ is now Syzygospora mycetophila. So? I also think it’s a field guide name for a species complex but don’t know how to tell them apart. “Christiansenia” and “Syzygospora” are apparently synanomous genera for Collybia Jelly. Lincoff says species can only be seperated microscopically. I assume they all grow on Gymnopus fruit bodies.